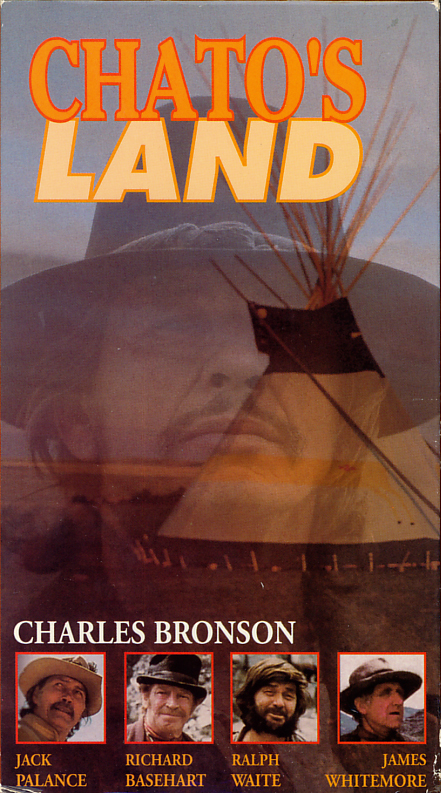 Chato’s Land on VHS. Movie starring Charles Bronson, Jack Palance, Richard Basehart, Ralph Waite, James Whitmore. Directed by Michael Winner. 1972. Chato has been on the wrong side of a sheriff’s posse most of his life. This time, Chato is wrongly accused of murder, and is running for his life! The posse is being led by a crazed sheriff, Jack Palance… and the bloodthirsty posse doesn’t care if Chato is innocent, they want a hanging! Being chased for a crime he didn’t commit, Chato turns into an angry Indian warrior bent on revenge! 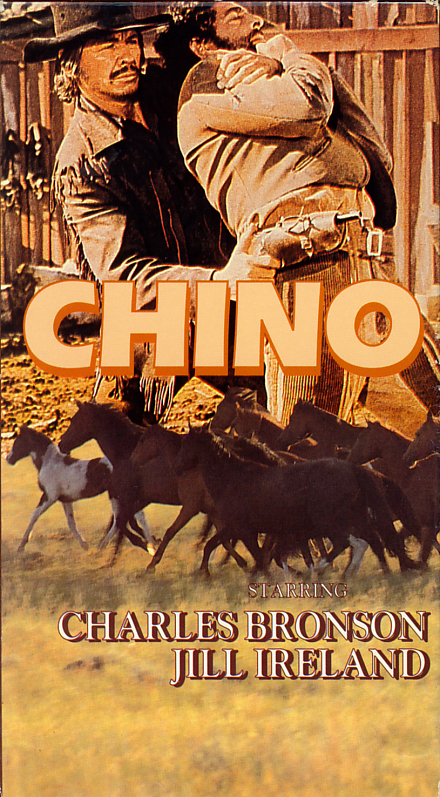 Chino movie on VHS. Starring Charles Bronson, Jill Ireland. With Marcel Bozzuffi, Vincent Van Patten. Directed by John Sturges, Duilio Coletti. 1973. Charles Bronson is the best horse breeder and trainer in the rough, rugged Southwest territory. His reputation for having the finest cowboy horses is legendary. Chino’s only problem is that he is as rough and tough as his horses! His rugged individualism and fighting has made him enemies with the town’s Sheriff and neighboring landowners. Befriended only by the Indians and a young boy, Chino continues his struggles to keep hold of the land and the horses he loves. Goin’ South on VHS. Starring Jack Nicholson, Mary Steenburgen, Christopher Lloyd, John Belushi. With Veronica Cartwright, Richard Bradford, Danny DeVito, Luana Anders, Ed Begley Jr., Tracey Walter. Directed by Jack Nicholson. 1978. Jack Nicholson plays Henry Moon, a third-rate outlaw, in this romantic comedy set in the 1860s. 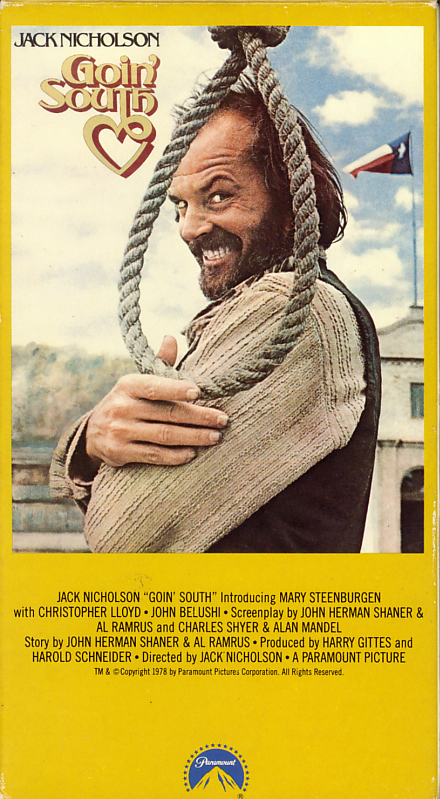 Nicholson is saved from hanging by the intervention of a lovely young woman who agrees to marry and take care of him. Mary Steenburgen plays Julia Tate, the headstrong but genteel Southern virgin who weds Nicholson only to help her work the gold mine she insists is on her property. Both Steenburgen and John Belushi make their film debuts in this amusing western.